The national museum in Qatar is fascinating. While relatively new, it houses some pretty historical exhibits. The National Museum was built in 1901, but it wasn’t a museum back then. It was actually the home of Sheikh Adbullah bin Jassim Al-Thani. This gigantic home turned museum was transformed in the 1970’s to house the traditions and archeological findings of the area. The 3 year restoration of the museum won awards for a perfect ending. Everything in the museum is now up to shape and a site to behold. Outside, there is a beautiful garden linked to three walls that has lots of foliage to gaze at. Also, in the garden is a traditional Bedouin tent that looks very similar to the ones used a long time ago. The tent is beautifully crafted and has never gotten any real use, so it tends to maintain its charm. 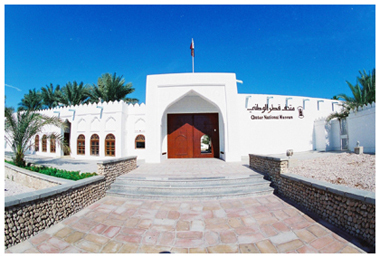 Revealing the history of Qatars first settlers, the first “majilis” that is used to house guests uncovers the secrets of the past. The Qatari marine ecosystem is on display as well. Back before the the discovery of oil, the marine way of life was a fundamental factor in survival. You had to know the sea and fish way of life back then in order to survive in Qatar. Rulership in early Qatar was based on military superiority and not much else. You can see a collection of military decorations that outline its own pavilion. It’s interesting to see the amount of dedication the military put into their seals and emblems. Built with traditional Qatari structuring in mind, the National Museum uses very thick walls to keep the place cool in the super hot summers. This wall structure has been tested throughout the ages to provide a very cool environment even in the hottest of temperatures. Air traps were used to provide the home with its own air conditioning system. This system effectively kept temperatures cool and allowed fresh air to enter the building without bringing inn additional sediment. Usually, around 1-2 hours will encompass everything the museum has to offer. You can have a great time with your friends, family, and loved ones. There is no cover charge so everyone gets in free! This is good, clean fun for anyone who enjoys learning about the history of a country.